Osteoarthritis (OA) is one of the most common causes of lameness in the adult horse. It is primarily a disease of the articular cartilage, a thin layer of protective material covering the surface of bones within joints, with progressive deterioration which can result in pain and inflammation. Whilst OA can be a significant source of pain, especially when the horse is being worked, this can often be controlled and horses are often able to continue being ridden and even competing if well controlled. There are many factors which may influence the development of OA in a horse- most commonly it is thought of as a wear and tear condition of older horses following years of hard work, but it can also develop suddenly in younger horses as a result of developmental joint disease (DJD), trauma or injury. Other compounding factors include conformation, weight and genetics. The diagnosis of OA is often made following a multimodal approach by your vet. This normally starts with a clinical examination, in which the vet will palpate and manipulate the limbs with the horse stood still, and then watch it move in a straight line and on a hard and soft lunge circle. Flexion tests are then often performed to increase the pressure on the joints and surrounding soft tissue structures. The next stage is usually nerve-blocking with local anaesthetic; this allows the area of pain to be identified by removing the sensation to different regions of the limb. A positive nerve block will often result in abolition of the lameness when the dynamic tests are repeated and an improvement in the horse’s way of going. The local anaesthetic can either be placed under the skin next to a nerve (perineural) or into a joint (intra-articular). 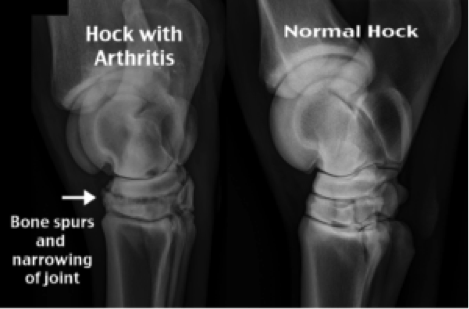 Following this, imaging of the joints is normally required with radiography (x-ray) the main technique used. This allows assessment of the bones of the joint including their density, shape and the space around them. Radiographic changes frequently observed with OA may include new bone formation or bone loss, reduction of joint space and irregular margins. Other imaging modalities include ultrasonography, nuclear scintigraphy and even magnetic resonance imaging (MRI), however these are more often used in unusual or complex cases of lameness originating from more than one source or in a horse not amenable or with inconclusive nerve blocking. 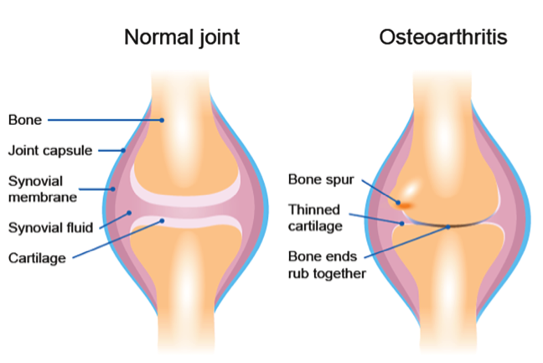 Once OA of a joint has been diagnosed the treatment is usually conservative. Each case will be considered as an individual, with the aforementioned compounding factors and the horse’s workload and work history playing an important part in the management plan. Initial treatment may involve a combination of physical and drug-based approaches. Early diagnosis can be very beneficial to long-term management by implementing changes which may slow the progression of disease, alleviate pain and maintain the horses’ way of going. Concurrent work with your physiotherapist and farrier may also help by providing additional musculoskeletal support. Gentle ongoing low-grade movement is usually beneficial with inactivity causing further stiffening so daily exercise or turn out is important. Pharmacologically, the mainstay treatment is oral non-steroidal anti-inflammatory (NSAID) drugs such as phenylbutazone (bute) or suxibuzone (danilon). Whilst they will not modify the course of the disease, they will provide pain relief and reduce inflammation which in turn will allow the horse to keep moving. Long term these may have side effects including kidney and gastro-intestinal issues and such use should therefore be monitored and is often cautioned against. Alternative pharmacological intervention includes direct corticosteroid medication into the joint. This provides a targeted anti-inflammatory effect and will also have the potential to modify the disease process. However used incorrectly or over frequently, joint medication may have deleterious effects on the joint cartilage as well, and also carry the potential increased risk of laminitis and joint infection in the acute short-term. Other treatment options include the use of bisphosphates, hyaluronic acid, and joint supplements (neutraceuticals). There is limited scientific evidence to support the use of neutraceuticals in horses, although recent studies have highlighted boswellia and green-lipped muscles as potentially important ingredients. A last-resort treatment suitable to some joints is surgical or chemical fusion (arthrodesis). This reduces the potential for movement in a low-motion joint and can be very effective at alleviating pain, although is an irreversible change and may not be suitable for many cases. A further area of increasing interest is the use of biological therapies; i.e. re-introducing cells or proteins extracted from a horse, back into the damaged area or joint. Currently these include PRP and IRAP, and are designed to increase the health of the joint fluid and stimulate cellular repair. A new approach that is increasingly used is a polyacrylamide hydrogel with can be injected into some joints to increase cushioning and thus alleviate pain. It is important to weigh up the safety, proven efficacy and cost of any of these treatments, and what may be of most benefit to your horse. There are no medical treatments that can reverse the cartilage damage associated with OA. The best approach is to find a balance of management for the individual which will suit you both as a team. If you’d like to discuss with a member of the Oakhill Equine Vet Team, please contact us.